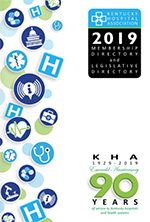 Hospital chief executive officers should receive their 2015-2016 KHA Membership Directory in the mail shortly. For any changes needed to your hospital’s listing throughout the year, please contact Donna Skinner at KHA (dskinner@kyha.com). KHA distributes updates at least semi-annually. Hospital chief executive officers should receive their 2014-2015 KHA Membership Directory in the mail this week. For any changes needed to your hospital’s listing throughout the year, please contact Donna Skinner at KHA (502-426-6220 or via email at dskinner@kyha.com). KHA distributes updates at least semi-annually.